You are currently browsing the category archive for the ‘Judgment Day’ category. 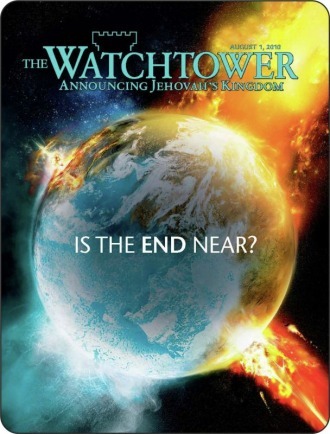 The Jehovah’s Witnesses teach that only they will survive the “Battle of Armageddon”, all non-witnesses will be destroyed on site, and that the birds of heaven will be called to eat the flesh of the dead (Revelation 19:19, 20) They teach that the world will be in peace for a thousand years, at that time Satan will be allowed one last chance to deceive the people, at that time Satan and all those who side with him will be destroyed in the second death. What do the Scriptures really say about Armageddon? Below are a list of Scriptural comments examining the teachings of Jehovah’s Witnesses on this subject. People who live in so-called “judgment periods” will be resurrected. All final judgment for the world is reserved for the Millennial Judgment Day. Adam was a sinner and was justly sentenced to death. But so are all of his children. Romans 3:10 just as it is written: “There is not a righteous [man], not even one. If Adam had not sinned, no ransom would be needed. The ransom (corresponding price) consisted of the sacrifice of the perfect man Jesus to redeem the perfect man Adam who had sinned. Incidentally Adam’s offspring were condemned and incidentally they are redeemed. Romans 5:18 Therefore, as through one man’s offense [judgment] came to all men, resulting in condemnation, even so through one Man’s righteous act [the] [free] [gift] [came] to all men, resulting in justification of life. The slaying of animal sacrifices in the Old Testament pointed forward to Christ’s scarifice to cover sins. Since it was God’s intention to redeem Adam from death, He provided him with a cost of skin. Genesis 3:21 And Jehovah God proceeded to make long garments of skin for Adam and for his wife and to clothe them. There are no Scriptures to show that Adam is excepted from the benefits of the ransom. The disobedient angels, who were largely responsible for the evil and corruption in Noah’s day, were not then judged. Since their judgment day is still future, it seems reasonable that the people will also be judged in the future. 2 Peter 2:4 Certainly if God did not hold back from punishing the angels that sinned, but, by throwing them into Tar’ta·rus, delivered them to pits of dense darkness to be reserved for judgment. Jude 6 And the angels that did not keep their original position but forsook their own proper dwelling place he has reserved with eternal bonds under dense darkness for the judgment of the great day. Romans 5:12-14 That is why, just as through one man sin entered into the world and death through sin, and thus death spread to all men because they had all sinned-. 13 For until the Law sin was in the world, but sin is not charged against anyone when there is no law. 14 Nevertheless, death ruled as king from Adam down to Moses, even over those who had not sinned after the likeness of the transgression by Adam, who bears a resemblance to him that was to come. There are no Scriptures to show that the people in Noah’s day are excepted from the benefits of the ransom. The Sodomites would have repented and not been destroyed if they had received as much light as Capernaum in Jesus’ day. Sodom’s judgment day is yet future. The Scriptures definitely prophesy the return of the Sodomites from Death. Ezekiel 16:55, 61-62 And your own sisters, Sod’om and her dependent towns, will return to their former state, and Sa*mar’i*a and her dependent towns will return to their former state, and you yourself and your own dependent towns will return to YOUR former state….And you will certainly remember your ways and feel humiliated when you receive your sisters, the ones older than you as well as the ones younger than you, and I shall certainly give them to you as daughters, but not owing to your covenant.’…”‘And I, I myself, will establish my covenant with you; and you will have to know that I am Jehovah. Jude 7 So too Sod’om and Go·mor’rah and the cities about them, after they in the same manner as the foregoing ones had committed fornication excessively and gone out after flesh for unnatural use, are placed before [us] as a [warning] example by undergoing the judicial punishment of everlasting fire. Jesus clearly said that the period of his earthly ministry was not a time of judgment. But if anyone hears my sayings and does not keep them, I do not judge him; for I came, not to judge the world, but to save the world. 48 He that disregards me and does not receive my sayings has one to judge him. The word that I have spoken is what will judge him in the last day. The Scribes and Pharisees must come forth from the dead in the Kingdom in order to “see” Abraham , Isaac and Jacob. They will be “thrown outside” of the position of rulership due to their unfaithfulness. Luke 13:28 There is where [YOUR] weeping and the gnashing of [YOUR] teeth will be, when YOU see Abraham and Isaac and Jacob and all the prophets in the kingdom of God, but yourselves thrown outside. Even those who crucified Jesus were considered as doing it in ignorance. Acts 3:12-17 When Peter saw this, he said to the people: “Men of Israel, why are YOU wondering over this, or why are YOU gazing at us as though by personal power or godly devotion we have made him walk? The God of Abraham and of Isaac and of Jacob, the God of our forefathers, has glorified his Servant, Jesus, whom YOU, for YOUR part, delivered up and disowned before Pilate’s face, when he had decided to release him. Yes, YOU disowned that holy and righteous one, and YOU asked for a man, a murderer, to be freely granted to YOU, whereas YOU killed the Chief Agent of life. But God raised him up from the dead, of which fact we are witnesses. Consequently his name, by [our] faith in his name, has made this man strong whom YOU behold and know, and the faith that is through him has given the man this complete soundness in the sight of all of YOU. And now, brothers, I know that YOU acted in ignorance, just as YOUR rulers also did. Spiritual Israel, the Church class, gains the chief favor, the heavenly reward, but natural Israel is not cast off. Romans 11:2, 15, 25-26, 32 God did not reject his people, whom he first recognized. Why, do YOU not know what the Scripture says in connection with Eli’jah, as he pleads with God against Israel?…For if the casting of them away means reconciliation for the world, what will the receiving of them mean but life from the dead?…For I do not want YOU, brothers, to be ignorant of this sacred secret, in order for YOU not to be discreet in your own eyes: that a dulling of sensibilities has happened in part to Israel until the full number of people of the nations has come in, 26 and in this manner all Israel will be saved. Just as it is written: “The deliverer will come out of Zion and turn away ungodly practices from Jacob… For God has shut them all up together in disobedience, that he might show all of them mercy. The New Covenant is yet to be made with natural Israel and their iniquity forgiven. Jeremiah 24:6-7 And I will set my eye upon them in a good way, and I shall certainly cause them to return to this land. And I will build them up, and I shall not tear down; and I will plant them, and I shall not uproot. 7 And I will give them a heart to know me, that I am Jehovah; and they must become my people, and I myself shall become their God, for they will return to me with all their heart. The Jews are to be used as a “teacher nation” in the Millennium. Some will definitely survive Armageddon who were unrighteous and disobedient. The marking and slaying of Ezekiel 9:4-6 and Revelation 7:1-3 are not literal. Ezekiel 9:4-6 And Jehovah went on to say to him: “Pass through the midst of the city, through the midst of Jerusalem, and you must put a mark on the foreheads of the men that are sighing and groaning over all the detestable things that are being done in the midst of it.” And to these [others] he said in my ears: “Pass through the city after him and strike. Let not your eye feel sorry, and do not feel any compassion. Old man, young man and virgin and little child and women YOU should kill off-to a ruination. But to any man upon whom there is the mark do not go near, and from my sanctuary YOU should start.” So they started with the old men that were before the house. [NOTE: The Revelation account continues that only the 144,000 were sealed, showing the marking to be symbolic or acceptance in the heavenly bride class, and the slaying symbolic of rejection or casting off from this position, not the sealing of Jehovah’s Witnesses and the destruction of all others. Some Scriptures speak of mankind or certain ones not rising again. This refers to their not rising throughout the reign of sin and death, but in the Millennial Age they will come forth in the resurrection. Job 14:10-15 But an able-bodied man dies and lies vanquished; And an earthling man expires, and where is he? Waters do disappear from a sea, And a river itself drains off and dries up. Man also has to lie down and does not get up. Until heaven is no more they will not wake up, Nor will they be aroused from their sleep. O that in She’ol you would conceal me, That you would keep me secret until your anger turns back, That you would set a time limit for me and remember me! If an able-bodied man dies can he live again? All the days of my compulsory service I shall wait, Until my relief comes. You will call, and I myself shall answer you. For the work of your hands you will have a yearning. Isaiah 26:14-19 They are dead; they will not live. Impotent in death, they will not rise up. Therefore you have turned your attention that you might annihilate them and destroy all mention of them. You have added to the nation; O Jehovah, you have added to the nation; you have glorified yourself. You have extended afar all the borders of the land. O Jehovah, during distress they have turned their attention to you; they have poured out a whisper [of prayer] when they had your disciplining. Just as a pregnant woman draws near to giving birth, has labor pains, cries out in her birth pangs, so we have become because of you, O Jehovah. We have become pregnant, we have had labor pains; as it were, we have given birth to wind. No real salvation do we accomplish as regards the land, and no inhabitants for the productive land proceed to fall [in birth]. “Your dead ones will live. A corpse of mine-they will rise up. Awake and cry out joyfully, YOU residents in the dust! For your dew is as the dew of mallows, and the earth itself will let even those impotent in death drop [in birth]. Jeremiah 51:57 And I will make her princes and her wise ones, her governors and her deputy rulers and her mighty men drunk, and they must sleep an indefinitely lasting sleep, from which they will not wake up,” is the utterance of the King, whose name is Jehovah of armies. Psalm 9:17 Wicked people will turn back to She’ol, Even all the nations forgetting God. The Judgment and separation of the sheep and goats is not taking place now. First the Church class must be completed and glorified, since they are the “angels” who are with Jesus at the time. “Angels” is from the Greek word AGGELOS, meaning “messengers”, as in James 2:25 – Rahab the harlot was justified by works, when she had received the messengers. (Revelation 3:21) To the one that conquers I will grant to sit down with me on my throne, even as I conquered and sat down with my Father on his throne. (1 Corinthians 6:2) Or do YOU not know that the holy ones will judge the world? And if the world is to be judged by YOU, are YOU unfit to try very trivial matters? (Colossians 3:4) When the Christ, our life, is made manifest, then YOU also will be made manifest with him in glory. The judgment is based on the works done: feeding the strangers, clothing the naked, visiting those in prison and the sick, etc. These are symbolic of an attitude of love and helpfulness to fellow men, assisting each other up the highway of holiness toward perfection during the Millennial Age. The term “brothers” need not be limited to the Church in the Gospel Age, but can also be applied to those who do God’s will in the Millennial Age. Those who would so limit it (to try to prove the setting is not future) run into the inconsistency of having the sheep class (earthly) ministering food etc., (truth) to Christ’s brothers (the Church Class) while they really believe the reverse is true – That the spirit-begotten remnant of the Church class ministers the truth to the other sheep class. A similar acount of the judgment day is given in Revelation 20:11-15, and is definitely shown to be during the reign of Christ and the Church. The Millennial Age – the Judgment Day taught in the Bible. There is a day of judgment, the Millennial Age, rather than various judgment periods. Acts 17:31 because He has appointed a day in which He is going to judge the world in righteousness by a Man whom He appointed, having given proof to all by raising Him from the dead. 2 Pet. 3:7-8 But the present heavens and the earth being kept in store by the same word, are being kept for fire until the day of judgment and destruction of ungodly men. But, beloved, let not this one thing be hidden from you, that one day is with the Lord as a thousand years, and a thousand years as one day. That time is yet future. Psalm 96:10-13 Say among the nations, the LORD reigns; and the world shall be established; it shall not be moved; He shall judge the peoples in uprightness. Let the heavens rejoice, and let the earth be glad; let the sea roar, and the fullness of it. Let the field be joyful, and all that is in it; then shall all the trees of the forest rejoice before the LORD; for He comes, for He comes to judge the earth; He shall judge the world with righteousness, and the people with His truth. Isa. 26:9-10 With my soul I desired You in the night; yea, with my spirit within me I will seek You early; for when Your judgments are in the earth, the people of the world learn righteousness. Let favor be shown to the wicked, yet he will not learn righteousness; in the land of uprightness he will deal unjustly, and will not behold the majesty of the LORD. Psa. 72:2-8 He will judge Your people in righteousness, and Your poor with judgment. The mountains shall bring peace to the people, and the little hills by righteousness. He shall judge the poor of the people; He shall save the children of the needy, and shall crush in pieces the cruel one. They shall fear You as long as the sun and moon endure, throughout all generations. He shall come down like rain on the mown grass, like showers that water the earth. In His days the righteous shall flourish; and abundance of peace, until the moon is not. He shall also have the rule from sea to sea, and from the River to the ends of the earth. That judgment day will be for the whole world. Acts 24:15 And I have hope toward God, which they themselves also allow, that there shall be a resurrection of the dead, both of the just and unjust. Phil. 2:10-11 that at the name of Jesus every knee should bow, of heavenly ones, and of earthly ones, and of ones under the earth; and that every tongue should confess that Jesus Christ is Lord, to the glory of God the Father. The Ransom sacrifice releases Adam and his offspring from first death (Adamic), but second death is a death from which there will never be a resurrection. An individual must be released (reckonedly or actually) from Adamic death before it is possible to suffer second death. Before the Gospel Age none were released from Adamic death, so none were released from Adamic death. During the Gospel Age, only those who are enlightened with the truth, justified by the blood of Christ (reckonedly released from Adamic death), and spirit begotten, and who then deny Christ and fall away from the truth go into second death. Only the prospective members of the body of Christ are now justified and on trial. Heb. 6:4-6 For it is impossible for those who were once enlightened, and have tasted of the heavenly gift, and were made partakers of the Holy Spirit, and have tasted the good Word of God and the powers of the world to come, and who have fallen away; it is impossible, I say, to renew them again to repentance, since they crucify the Son of God afresh to themselves and put Him to an open shame. Heb. 10:26-29 For if we sin willfully after we have received the knowledge of the truth, there remains no more sacrifice for sins, but a certain fearful looking for judgment and fiery indignation, which shall devour the adversaries. He who despised Moses’ law died without mercy on the word of two or three witnesses. Of how much worse punishment, do you suppose, will be thought worthy to receive punishment, the one who has trampled the Son of God, and who has counted the blood of the covenant with which he was sanctified an unholy thing, and has insulted the Spirit of grace? Matt. 12:31 Therefore I say to you, All kinds of sin and blasphemy shall be forgiven to men, but the blasphemy against the Holy Spirit shall not be forgiven to men. During the Millennial Age, after coming forth in the resurrection (actually released from Adamic death), those who continue to be disobedient to God will fall into second death. The whole world will then be on trial for life or death (second death). Psa. 145:20 The LORD watches over all those who love Him; but all the wicked He will destroy. Rev. 20:12-15 And I saw the dead, the small and the great, stand before God. And the books were opened, and another book was opened, which is the Book of Life. And the dead were judged out of those things which were written in the books, according to their works. And the sea gave up the dead in it. And death and hell delivered up the dead in them. And each one of them was judged according to their works. And death and hell were cast into the Lake of Fire. This is the second death. And if anyone was not found having been written in the Book of Life, he was cast into the Lake of Fire. Adam and all his children are under God’s condemnation and dead in his sight, without any standing before him, until they learn of and exercise faith in the ransom. It makes no difference whether one dies at an early age by a specific act of God or later in life by so-called natural causes; both are the results of sin and divine condemnation. Rom. 6:23 For the wages of sin is death, but the gift of God is eternal life through Jesus Christ our Lord. Matt. 8:22 But Jesus said to him, Follow Me, and let the dead bury their dead. 1 Tim. 2:4 who will have all men to be saved and to come to the knowledge of the truth. The view that God desires to destroy all people except those of one denomination is not in harmony with God’s will. God desires to bless, not to destroy mankind. Luke 9:53-55 And they did not receive Him, because His face was going toward Jerusalem. And seeing, His disciples James and John said, Lord, do You desire that we command fire to come down from Heaven and consume them, even as Elijah did? But He turned and rebuked them and said, You do not know of what spirit you are. Isa. 60:2-5 For behold, the darkness shall cover the earth, and gross darkness the peoples; but the LORD shall rise on you, and His glory shall be seen on you. And the nations shall come to your light, and kings to the brightness of your dawning. Lift up your eyes all around, and see. All of them gather themselves; they come to you. Your sons shall come from far, and your daughters shall be nursed at your side. Then you shall fear and become bright, and your heart shall throb and swell for joy; because the abundance of the sea shall turn to you, the wealth of the nations will come to you. John 12:32 And I, if I am lifted up from the earth, I will draw all to Myself. Luke 2:10 And the angel said to them, Do not fear. For behold, I give to you good tidings of great joy, which shall be to all people. Eze. 18:21-23 But if the wicked will turn from all his sins which he has committed, and keep all My statutes, and do justice and right, he shall surely live; he shall not die. All his transgressions that he has done, they shall not be mentioned to him; in his righteousness that he has done he shall live. Do I actually delight in the death of the wicked? says the Lord Jehovah. Is it not that he should turn from his ways and live?